With the sudden rise of Bitcoin at the end of 2017, blockchain has become a mainstream term. But a lot of people still don’t understand the incredible potential this technology holds, especially in its role in the supply chain and the warehouse digitalization movement. This article will be your primer for blockchain technology, its potential in warehouse operations, and how it fares in the industry. Blockchain is a distributed ledger technology that exchanges record transactions between parties in a secure way. 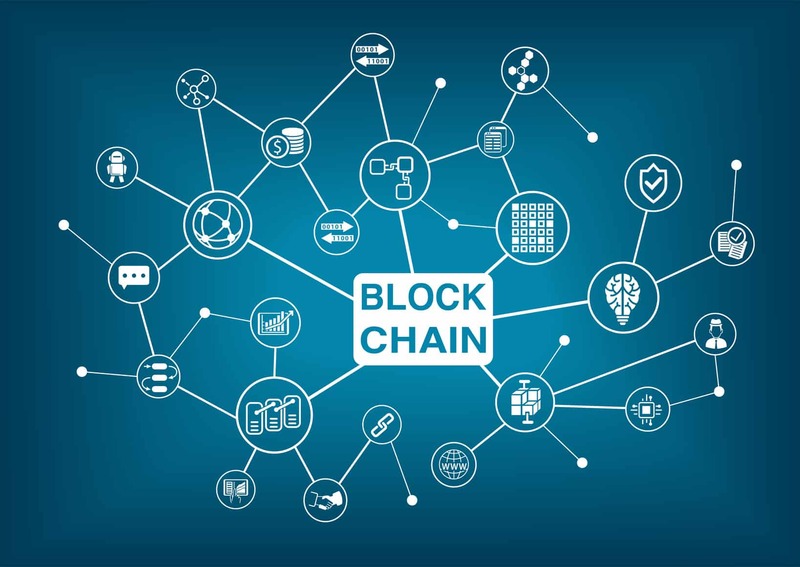 To put it more simply: it is blocks of data that are chained, hence the term blockchain, which are shared by all computers in a network, thus making them accessible to relevant parties. 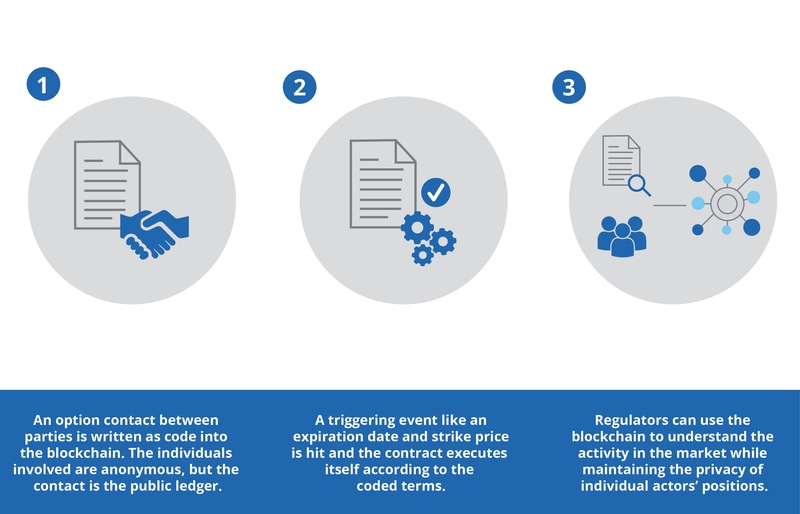 Blockchain brings three main features – Accessibility, Security, and Accountability. Blockchain, being shared by all parties, makes data accessible for everyone involved. 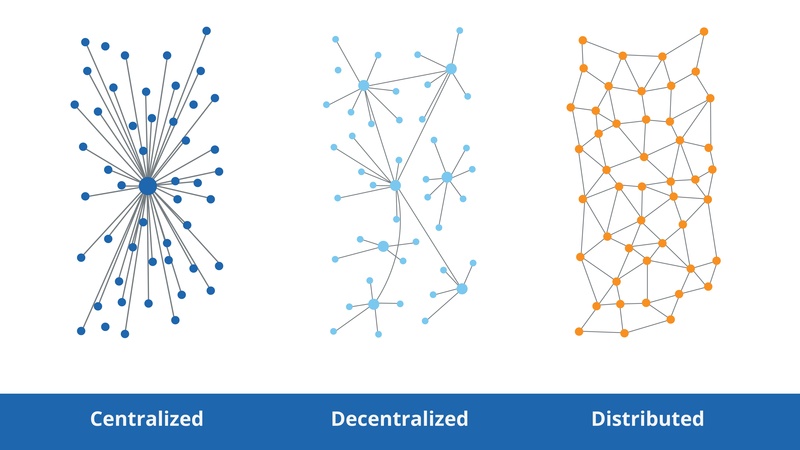 The data is stored on every computer, so that it is both decentralized and distributed. This creates a high level of security because hackers would need to access and alter the data on all linked computers at the same time just to change one transaction. As a single, fixed cache of information, blockchain ensures accountability by everyone in the network. This distributed approach to data management makes blockchain a preferred platform to protect data and increase accountability while making it easily accessible to the intended parties. Excellence in logistics is achieved by seamless collaboration between every stakeholder in the supply chain, including the warehouse. Having many entities involved with multiple complex technologies results in weak collaboration and limited transparency. Blockchain will link relevant parties on the same data platform while guaranteeing data security and easy communications. Also, Smart Contracts, which are self-executing contracts with terms of agreement between two parties written into lines of code, can be utilized by the warehouse to automate verifications and payment. For example, when a connected pallet is delivered, the received confirmation, time of delivery, and condition will be transmitted to the blockchain system to be verified, so long as they are in the agreed conditions. If verified, proper payments will be released to the appropriate parties. This type of automation greatly increases efficiency, integrity, and security. Where is Blockchain in the Industry Now? 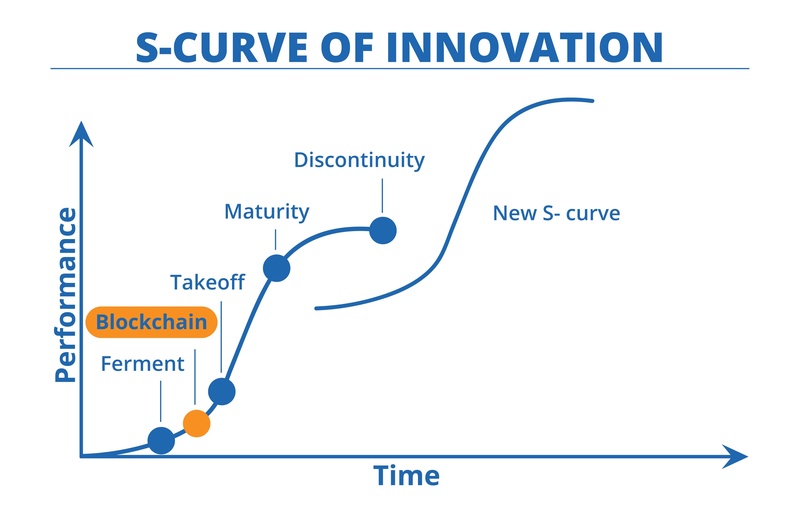 To determine blockchain’s position in the industry, three adoption frameworks will be used – The S-Curve of Innovation Diffusion, the Technology Adoption Life Cycle, and the Hype Cycle. Blockchain is currently in the Ferment Stage of the S-Curve – where the Internet was 20 years ago. Especially with the recent rise of Bitcoin at the end of 2017, blockchain has gathered a lot of attention, but it still needs education from the adopters. 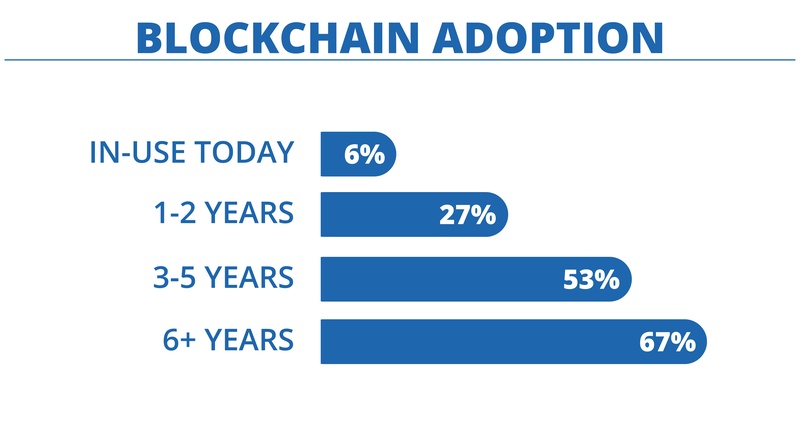 Blockchain is now being adopted by the Early Adopters. 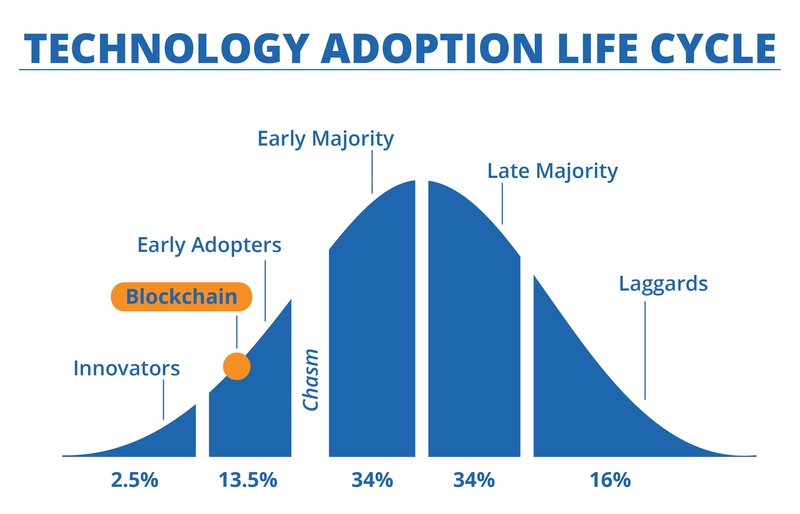 As mentioned by the 2018 MHI Industry Report, 6% of the respondents are using blockchain, which puts it above the Innovators group but not yet at the point of crossing the chasm. "What the internet did for communications, blockchain will do for trusted transactions." 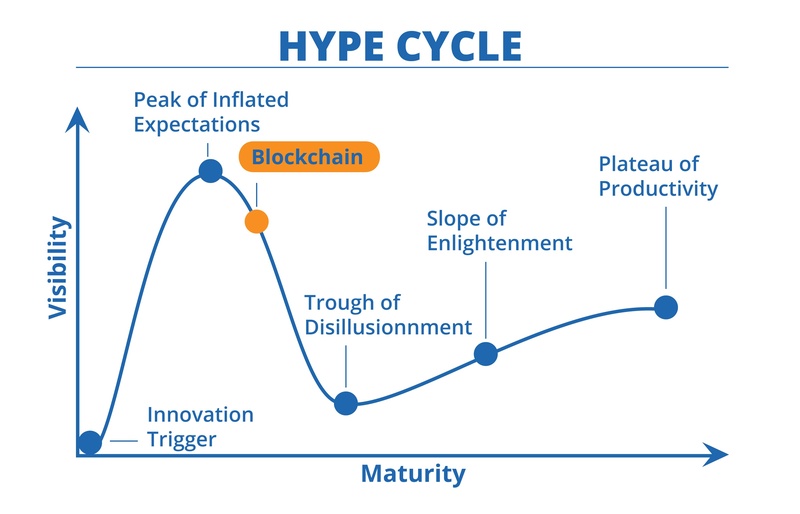 The Hype Cycle also suggests that blockchain will reach the plateau in 5 to 10 years, meaning potential adopters still have time to evaluate the pros and cons. Blockchain is slowly moving forward from being an edge to an opportunity to later an essential. Big names such as Walmart, UPS, Maersk, FedEx, British Airways, and Samsung are implementing the technology for their supply chains. In fact, startups built as recently as 2017 are using blockchain as their core technology or edge in the market. Blockchain in supply chain management will strengthen the collaboration and data sharing that the industry has sought for many years. Blockchain will address long prevailing concerns such as security, privacy, and control over data. No doubt, this emerging technology is something that supply chain leaders must not ignore. If you have other questions about blockchain, warehouse technologies or help with your warehouse, let us know by commenting below or contacting us.